The Houston clinic of Michael Jackson's doctor has been searched by drug police looking for evidence of manslaughter, his lawyer says. 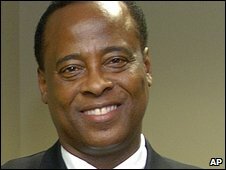 Officers from the Drug Enforcement Agency (DEA) entered Dr Conrad Murray's office and removed several items. Dr Murray's spokeswoman told the BBC the raid was "a surprise to us and it was a surprise to the attorneys". The doctor, who police say is not a suspect, was at Jackson's mansion and tried to revive him before he died. 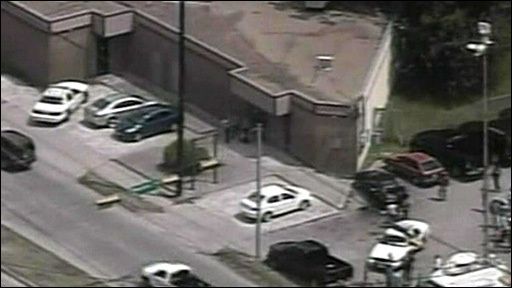 DEA spokeswoman Violet Szeleczky confirmed a search was carried out but said it was not technically a raid. Speaking to the AFP news agency, she said: "What this is, is the Los Angeles police department have an investigation and they came to the Drug Enforcement Agency, and they asked us to help them effect a state search warrant here." Dr Murray's lawyer, Edward Chernoff, confirmed that a search had been carried out. "The search warrant authorised law enforcement to search for and seize items, including documents, they believed constituted evidence of the offence of manslaughter," he said in a statement posted on his firm's website. Earlier, Mr Chernoff said his client had been helping police with their inquiries. He has already been interviewed twice by police probing Michael Jackson's death. Investigators had asked for medical records in addition to those already provided by Murray. "The coroner wants to clear up the cause of death; we share that goal," said Mr Chernoff in a statement on his law firm's website on Tuesday. Speaking a few days after Jackson's death, Mr Chernoff denied Dr Murray administered painkilling drugs that could have contributed to the singer's death. Any drugs his client may have given to Jackson were in response to a specific health complaint, the lawyer added. He said the star still had a faint pulse and was warm when Dr Murray found him in bed. Mr Chernoff said: "He just happened to find him in his bed, and he wasn't breathing." Paramedics were called to Jackson's Los Angeles mansion while Dr Murray was performing CPR, according to a recording of the 911 call. Mr Chernoff said in Tuesday's statement that Dr Murray had since received unwelcome attention from those angry over the singer's untimely death. "Dr Murray was the last doctor standing when Michael Jackson died and it seems all the fury is directed toward him," Mr Chernoff said. He added: "Dr Murray is frustrated by negative and often erroneous media reports - he has to walk around 24/7 with a bodyguard. "He can't operate his practice. He can't go to work because he is harassed no matter where he goes."